We love visiting Port Dickson. It’s convenient to Kuala Lumpur and the airport and, best of all, it has some fabulous resorts with great prices. 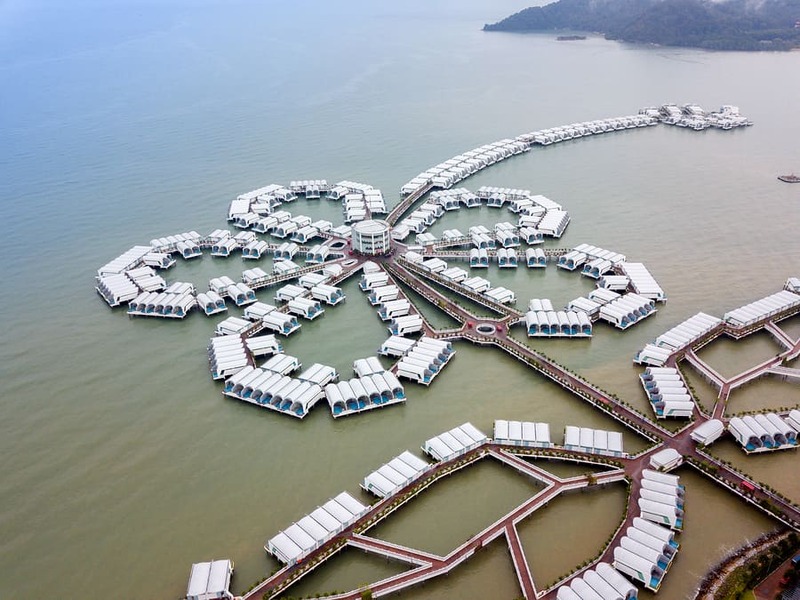 The best thing about the resorts, however, is that there are two which have the fabulous option of a Port Dickson villa with private pool. There is nothing quite as relaxing or luxurious as having a Port Dickson private pool right outside your window. We find it so much fun which makes it the perfect weekend or airport stopover. It gets even better though – both of these options also have the choice of an over-water Port Dickson villa with pool! I warn you, though, once you stay in one of these, you will never want to stay anywhere else! 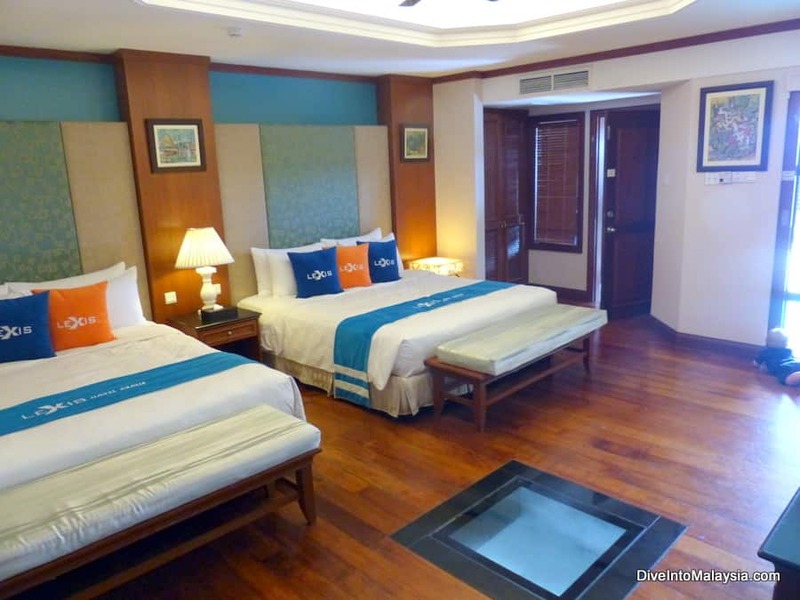 There are two options for a Port Dickson hotel with private pool – and we review both below. They are both good options and you can’t go wrong with either. We have a slight preference for the Hibiscus as we like the ocean views from the pool and it’s a bit newer and nicer. Both these hotels are a high standard with over water villas with private pools. In the why? below, I highlight the main difference. If you are looking for the perfect Port Dickson resort with private pool, you can’t go past the 5-star Grand Lexis. There are a range of options of a Port Dickson bungalow with swimming pool both on land and over the water. Click here to see prices now. The Grand Lexis Port Dickson private pool itself is great – a good depth and size for a private pool. We had a lot of fun out here. The villa itself is also lovely. It’s a great size and our family of five fit fine with two queen size beds and a cot. There is also a desk area, cupboards and a fridge with some complimentary soft drinks and bottled water. We enjoyed the glass panel in the floor and the ceiling fan and air conditioning. It has its own modem so wifi is good. A bonus if you are travelling with kids is that there is a lock up high on the door out to the pool so that they can’t reach it and are safe. Next to this room is a kitchenette with some crockery and cutlery, a sink, microwave and stools. The bathroom comes next and is large with ocean views from the shower. These areas are not cooled. There is also a shower out by the pool. We were upgraded at check in to a full ocean view which I would book on purpose next time for more privacy. My only complaint about this Port Dickson bungalow with private pool is that the way the room is laid out that it’s hard to take advantge of the ocean views and the fact we were over the water. It didn’t really feel like we had the views or the position as we only really saw the water if standing up outside or in the shower. This is a shame but, obviously, it was still great having a chalet in Port Dickson with private pool. The Grand Lexis also has many facilities such as a large communal pool, spa, bar, restaurant, water playground and bike rental. We liked making use of the room service so we didn’t need to leave our own pool. There are tons of other activities both inside and out with a big games room and an inflatable maze, archery, segways and mini electric cars. Most of the activities have an extra charge and they aren’t cheap. There is also an indoor playground and karaoke room. It’s in a handy location, not far from the middle of Port Dickson and there are eating options close by. All in all, the Grand Lexis is a fabulous place to stay and a great choice if you want a Port Dickson bungalow with pool. Click here to see the latest prices now! The Lexis Hibiscus Port Dickson is definitely a stand out – and I’m sure you will see why! 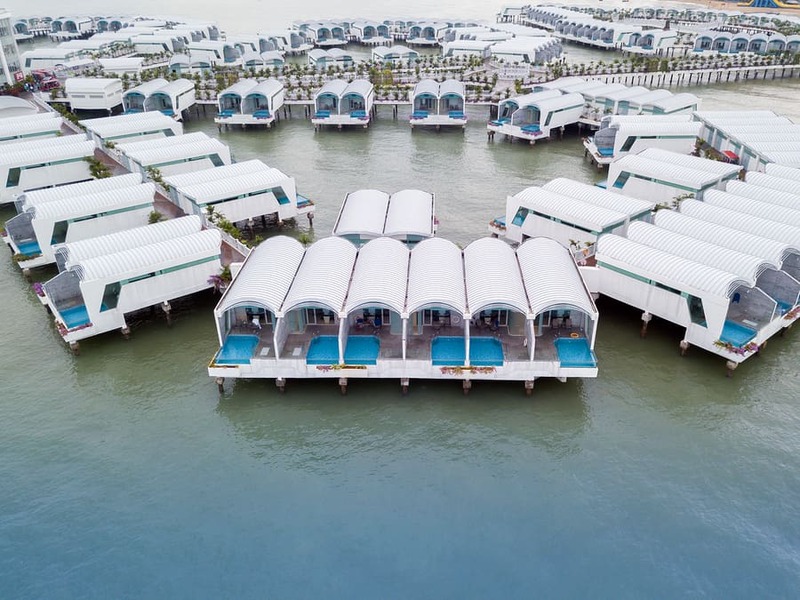 Another 5-star option, this hotel is not only impressive in its size but its layout – pictured above are its range of Port Dickson chalet with swimming pool arranged in a hibiscus shape. The surrounding area is also beautiful. The blue dots you see in the picture above are all the private swimming pools. In fact, the Lexis Hibiscus has a world record for the number of swimming pools! The rooms are somewhat similar to the Grand Lexis. There are two king-sized beds and a great panel for viewing under water. We found that more interesting here as our chalet was much further from the shore so there was more water and we could see fish jumping around in the water. The bedroom area leads into a large bathroom area and then on to the deck with the pool. Again, it would be good to have more views from the bedroom but there are much more stunning views to be had from the Lexis Hibiscus chalets thanks to the outdoor area being very open. For this reason, I do recommend paying more for a Premium Pool Sea View room where you have privacy, get better views and won’t be facing other villas. This Port Dickson swimming pool in room is awesome. You can’t do better for a private swimming pool Port Dickson if you want a view. While not as large as the Grand Lexis, it is an infinity pool looking straight over the water and it’s bigger than it looks in photos. There is also a couple of chairs and a small sauna. You can also chose to stay on land. All villas are well presented and comfortable. 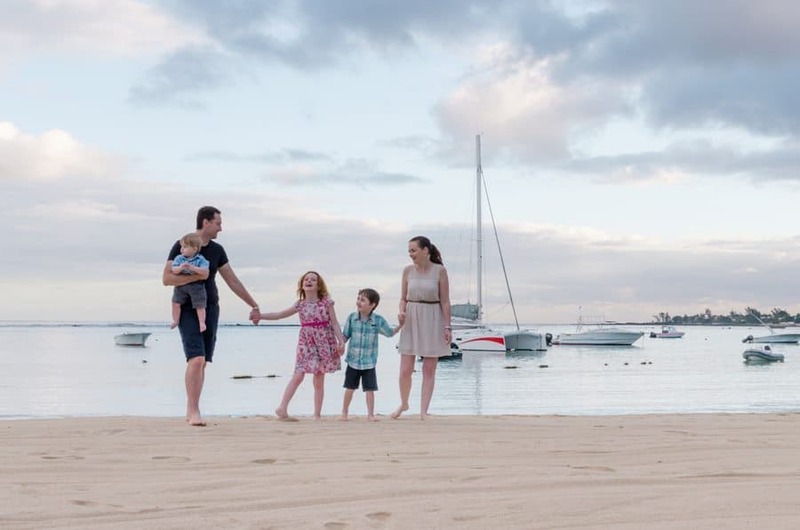 There are many other facilities and activities at the Lexis Hibiscus too including JWater Park (read more about it here). Many of these extra activities come at extra charge. There are many restaurants including a mini food court area. You won’t go hungry! There is also the option of a helicopter ride. This currently costs under MYR200 which is a bargain. It’s also perfect to stay here with kids with a big indoor play area/kids club, games room and outdoor activities. Adults will like the gym and karaoke room. All in all, if you are looking for a Port Dickson resort with private swimming pool, this is the premier choice! We love it. Click here to see the latest prices now. 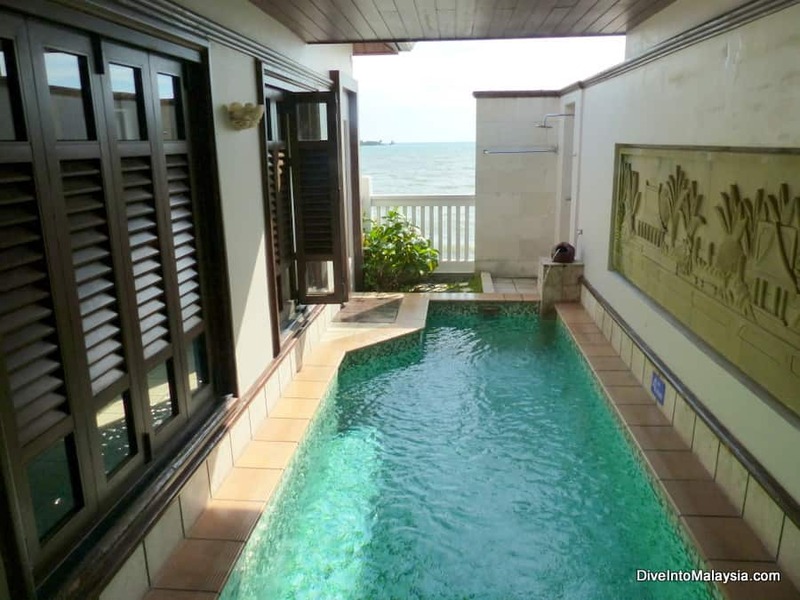 You can also find some Port Dickson homestays with private pool here. Looking for other things to do on your Port Dickson trip? Read our full guide to Port Dickson here or about the best Port Dickson beaches. You can find more Port Dickson hotel options here or the best Port Dickson resorts near the beach here.